Eurocom has further blurred the line between desktop and laptops computers by creating the Sky X9 ‘desktop laptop’. It is a laptop with desktop performance and desktop capability. It is built to give users the ability to carry desktop performance and the capability offered therein with them, wherever they choose to go. We live in an interesting time where the boundaries are being broken and destroyed on a daily basis. More proof of that is the EUROCOM Sky X9. Eurocom has been putting desktop processors into laptops for quite some time. Most recently the EUROCOM Panther 5 supported 12 core Intel Xeon processors. Eurocom has used this experience and expertise to further push the boundaries of possibilities by now creating a laptop that supports desktop processor and desktop graphics. 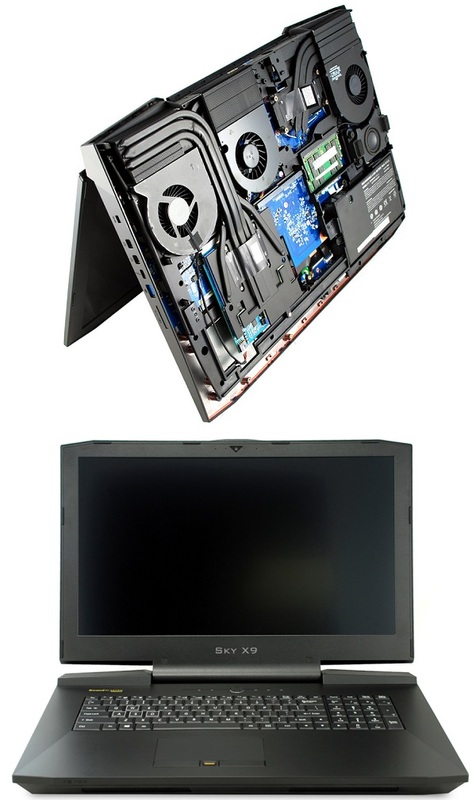 As more laptops and mobile workstations move toward BGA processors Eurocom is moving in the other direction by incorporating LGA processors and MXM based graphics into high performance Eurocom laptops. This allows for user freedom and upgradeability during purchase and after, throughout the life of their system. This formidable machine is literally busting at the seams with all of the best cutting-edge technology and oozing performance from every port. With configuration options up to and including a socketed desktop Intel Core i7 6700K processor, dual-channel DDR4 memory, desktop GTX 980 graphics card—that’s right, desktop twice in the same sentence—this beast is ready to tackle anything. Dual PCIe M.2 SSD’s are also supported, plus dual 2.5” SATA 6.0GB/s drive options, both with multiple RAID configuration options, five SuperSpeed USB 3.0 ports and USB 3.1/Thunderbolt 3 technology to the arsenal. Now, add extraordinary 17-inch FHD IPS, G-SYNC and 4K display configuration options. Add HDMI, HDMI over Thunderbolt, dual DisplayPort, 7.1 analog and optical audio output. Pinch yourself. You are not dreaming. Users can finally have that PC equivalent of a Swiss Army knife that overdosed on steroids, and it fits in a briefcase or backpack. Users can take desktop CPU overclocking adventures to unprecedented heights with seemingly endless menus and configuration options thanks to the exclusive unlocked BIOS/UEFI firmware options that Eurocom offers to their enthusiast clientele. Using the included desktop GPU overclocking software tools and available unlocked video BIOS, users will find themselves slicing through games and benchmarks like a hot knife through butter. With a massive thermal management system and up to 660W of power supply, this unlocked leviathan is built from the ground up with the intent of allowing users to create mayhem on an order of magnitude that will leave your opponents begging for mercy. If users are looking for an edge, you just found it. “In 1989 we created the first Desktop Replacement Notebook, in 2015 we have no created the first “desktop laptop’ system with socket based desktop Intel processor support and slot based MXM NVIDIA GeForce GTX 980 desktop graphics support to along with 64 GB of DDR4 memory.” Mark Bialic, Eurocom President. Eurocom manages to stuff all of this excellence into a chassis that is built like a Sherman tank, with looks that kill. With fully configurable RGB lighting in the keyboard and LCD cover, a keyboard and touchpad that are built like a fine European luxury car and an aggressive, yet very tasteful silhouette, this gorgeous machine is fitting for any environment. With the EUROCOM Sky X9 as your weapon of mass destruction, users will be ready for any task, at work or at play; no compromises required. EUROCOM Sky X9 is powered by desktop NVIDIA GeForce GTX 980 graphics, a fully unlocked GM204 core with 2048 CUDA cores. 8 GB memory with 7 Gbps memory clock and GDDR5 memory interface is supported. The EUROCOM Sky X9 is the first laptop with upgradeable desktop graphics supported inside, another amazing innovation from Eurocom. The NVIDIA GeForce GTX 980 is overclockable for maximum control and performance. Not only does the EUROCOM Sky X9 have upgradeable NVIDIA GeForce GTX 980 graphics, it also has socket based desktop Intel Skylake processors. The EUROCOM Sky X9 utilizes an Intel Z170 Chipset, socket LGA 1151 for support up to Intel Core i7-6700K processors. The Intel Core i7-6700K has 4 cores and 8 threads running at 4GHz, with turbo boost up to 4.2 GHz utilizing 14nm technology. The Intel Core i7-6700K is overclockable for maximum control and performance. M.2 wifi cards are supported for ultimate performance and upgradeability. Two 1Gb LAN RJ-45 ports Killer E2400 are supported. A beautiful 17.3” display is there to display the mind blowing performance held within the Sky X9. A future 4k display option will also be available for future upgrades. The EUROCOM Sky X9 can support up to 4 active displays through its two mini Display Ports, USB 3.1 and HDMI 2. Security is very important to Eurocom and our customers, because of this we have once again incorporated a Trusted Platform Module 2.0 (Infineon SLB9665-TCG) as well as a finger print reader and Kensington lock port. Eurocom knows that our customers are using their laptops for crucial mission critical applications. Four storage drives are supported for a plethora of configuration and upgrade options. Two 9.5 mm HDD or SSD bays and two M.2 SSD PCIe x4 SATA drives are supported with RAID 0/1/5/10 availability. Over 5 TB of storage is currently supported.